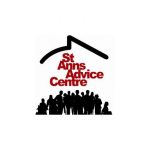 St Ann’s Advice Centre has has been a part of the community for over 20 years. We currently have staff dedicated to giving advice on debt, welfare benefits and employment. St Anns Advice Centre and The Neighbourhood Centre, where we are based, was hand built by volunteers to provide a place for the local community. A place where the public could receive advice and take part in activities. We started as a small organisation made up of a few volunteers and successfully secured some funding to provide help to the local community. Since then we have had many funders and the organisation has grown.